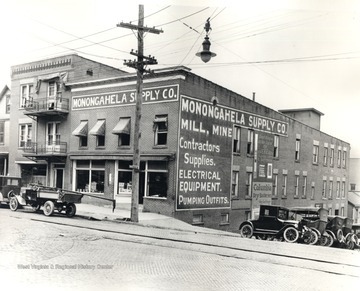 Exterior of Monongahela Supply Company, University Avenue, Morgantown. 2. Star Bus Company Buses, Morgantown, W. Va.
Star Bus Company Buses, Morgantown, W. Va. 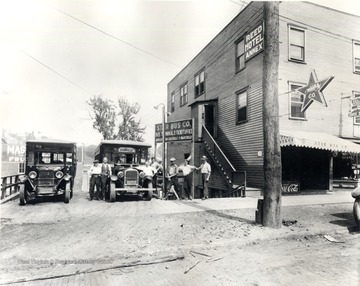 Exterior of Star Bus Company featuring employees posing for portrait with two buses; routes to Cassville and Maidsville are advertised; company office and the "Reed Hotel Annex" are in same building. 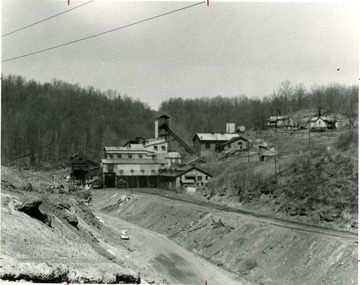 The headquarters of the White Oak Coal Co. are located at MacDonald, Fayette County, W. Va. The maintaining of the General Offices near the mines affords opportunity for closer supervision and better co-operation between all departments. 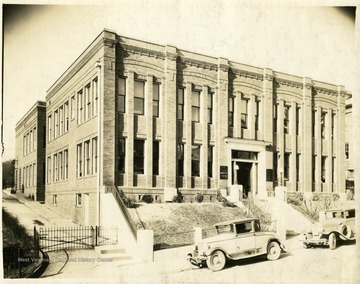 The machine and repair shops and warehouse for merchandise and mine supplies is located immediately adjacent to the office. A private branch telephone exchange with private leased lines reach each mine, giving 24 hour service. A printer telegraph instrument furnishes prompt telegraph service. Mail is received and forwarded at either Macdonald or Mount Hope post offices. 4. 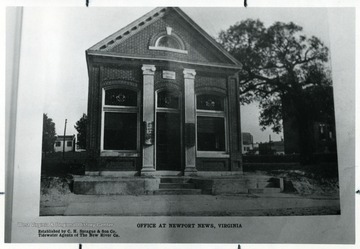 Office at Newport News, Va.
Office at Newport News, Va. Established by C.H. Sprague and Son Co., Tidewater Agents of the New River Company. 5. Miner's Children in front of their House, Wyatt, Harrison County, W. Va. 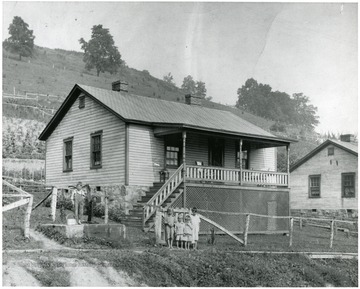 Miner's Children in front of their House, Wyatt, Harrison County, W. Va. The usual number of shoppers cars in front of Whipple Store. 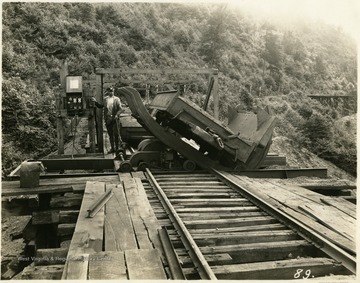 Miner operating a loading machine outside of a mine. 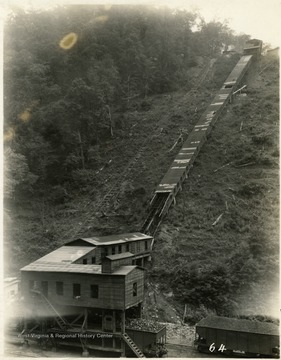 Tipple and conveyor at Chafin Jones Mine. 9. Tipple of C. C. B. Smokeless Coal Company No. 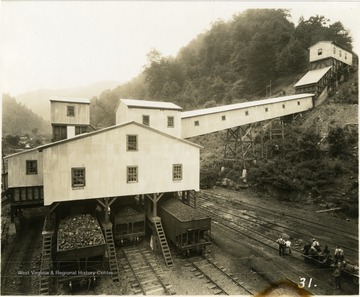 3 Mine at Helen, W. Va.
Tipple of C. C. B. Smokeless Coal Company No. 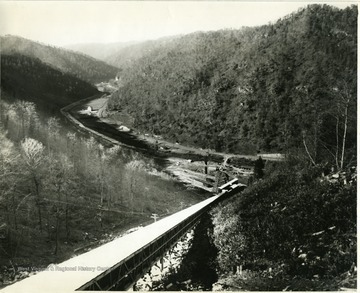 3 Mine at Helen, W. Va.
Tipple and Conveyor at C.C.B. 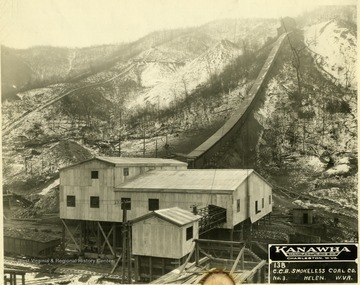 Smokeless Coal Co., Helen, W. Va.
View from top of mountain down conveyor line to the tipple. Oakwood Mine Tipple and surrounding buildings. 12. Tipple at Imperial, W. Va.
Tipple at Imperial, W. Va.